Contrary to what you have been told, bleeding gums are not normal and shouldn’t be ignored. Would you be concerned if your hands bleed every time you wash them? Your gums are no different. Bleeding that occurs when you floss, brush, or eat is usually caused by a bacterial infection and represents one of the first symptoms of gum disease (Periodontal Disease). Researchers are finding links between periodontal infection and other diseases of the human body. Heart Disease, Diabetes, Respiratory Disease, Osteoporosis, Artificial Joints, and Pregnancy complications seem to be connected to your oral health. The current theory is that bacteria present in infected gums breaks loose, travels though your bloodstream, and attaches itself to your heart or other body parts. A resent study found that 85% of heart-attack patients have periodontal disease, making this connection higher than the relationship between high cholesterol and heart attacks. Keep your mouth healthy! It is not “just a cleaning” anymore. See your dentist or hygienist at least twice a year for periodic maintenance and screening. Periodontal disease is often painless until it reaches more advanced stages, however there is a simple test that your dental team can use to uncover this problem even in its beginning stages. Like most diseases of the body early detection is essential. Also, remember to brush and floss. You will need to be an active participant in prevention. Gum disease is a serious infection that should always be taken seriously. If you answer yes to any of the following questions you may have periodontal disease. 1. Do your gums bleed when you brush, floss, or eat? 2. Do your teeth feel like they are moving? 3. Are your gums receding? 4. Do your teeth look longer? 6. Does your bite feel different? 7. Is it difficult for you to chew? 8. Have you noticed pus around your teeth? 9. Do your gums feel tender or look swollen? 10. Do your teeth or gums hurt? Over 80% of adults have gum disease. Smoking, excessive alcohol, diet, and poor oral hygiene can contribute to the onset and progression of the disease, but genetics seem to play a significant role. 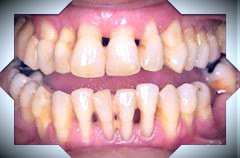 If there is a history of gum disease or premature tooth loss with your parents or siblings your chance of having this disease is extremely high. A better understanding of this disease has created new treatment alternatives. Antibiotics, deep cleanings, laser treatments, mouth rinses, and homecare, used individually or in combination, are reducing the need for more aggressive options like surgery.